Summer seems long when it’s just beginning—so many weeks while the kids are out of school—but before you know it, Labour day will roll around and there will be the smell of snow in the air. 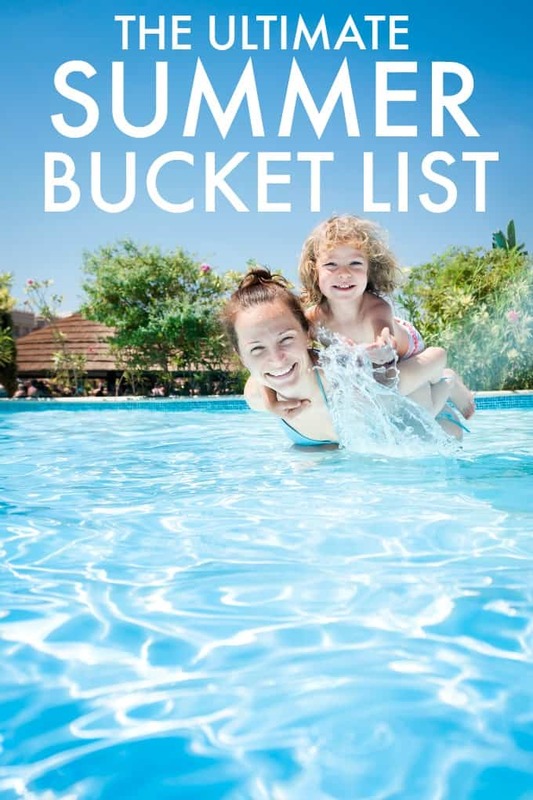 So, to get the maximum benefit out of all those lazy, hazy days of summer that you can, here’s the ultimate summer bucket list of things to do. There are so many things you can do in the great outdoors, and you don’t have to have a cottage or cabin to do them. Go fishing. There are areas for fishing throughout the country, whether in stocked ponds or in the wild! Check in with local licencing requirements to make sure you’re compliant but otherwise, go for it. Hiking or a nature walk. Add in a scavenger hunt sheet for kids to find things and make sure you stay clear of the poison ivy. Camping is a great way to get some outdoor time, away from tech, and commune with nature, even if it’s in your very own backyard. Go to the beach. Building a sandcastle is fun at an age. You can also play in the water, start a game of beach volleyball or fly a kite. Brings towels, umbrellas and snacks for a successful outing. Don’t forget a baggie for all the shells you’ll be collecting. Enjoy nighttime. If you can build an outdoor fire, go for it. Don’t forget the ‘smores! Stargazing is particularly fun outside of the city: you can see a lot when you get away from all the lights. Finding the right place to catch the sunset is a lovely evening. Can you catch a firefly? If it’s hot where you are, getting into water is a priority. Of course, if you don’t have a pool in your backyard, you don’t need to worry. There are a lot of other ways to soak some of the heat away. Check out local resources for splash pads, waterparks and pools that are open in the summer. Nothing says fun like cooling your toes! If you got bodies of water nearby, like lakes, look for canoe or kayak rentals, or just jump on in yourself. If you just had a rainstorm, go splash in some puddles. You’ll feel like you’re 4, all over again. Get some balloons and have yourself an epic water balloon fight. Sponges work well for this too. Even a run through the sprinkler is more fun you probably remember. Just because it’s summer doesn’t mean you can’t enjoy some cultural activities. Look for outdoor theatre or movies in your area: they are a great way to get in some culture while still enjoying the great outdoors. Check local events listings for cultural activities and festivals representing from different ethnic groups: powwows, food festivals from different countries and more. Summer is the perfect time to take in an outdoor concert. They’re not always headline bands, but it’s usually a good time. Summer is a time when you can eat certain foods with wild abandon. Okay, maybe not wild abandon, but it’s definitely a good time to relax the rules. You can eat outside, spit watermelon seeds and occasionally eat ice cream for dinner. Who says you can’t? Have a snow cone. Or a tropical drink (with or without the alcohol) complete with the little umbrella! Flag down the ice cream truck and have a soft serve… yes, even if it’s before bed time. S’mores. Need I say more? Here’s an indoor version, so you don’t even need a campfire to enjoy them. Anything you can get at a summer carnival: hot dogs, funnel cakes, corn on the cob and more. Lemonade. The kids can try their hand at a lemonade stand! It’s an excellent exercise in entrepreneurship and math skills. Also, it’s just a good time. Find some local farmers markets that you haven’t visited or take a trip out of town to visit one. Or go berry picking. The raspberries picked right off the bush just seem SO much sweeter than anything you can buy at the store. Even in summer, the weather isn’t always great, but you can still have tons of fun indoors! Build a blanket fort and sleep in it! Or put up a tent inside the living room. Your camping trip won’t be weather dependent. If you’ve always wanted to see some local tourist destination, museums or attractions, now is your chance. There are ALWAYS new movies out in the summer, blockbusters all, so make a list of your top two and go spend some time in a cool room with awesome popcorn on those rainy days. How about a home spa day? Mani, pedi, facemask and all? Make your own lip balm, while you’re at it. Just have the supplies for this activity handy, and on a rainy day, you won’t even need to run to the store first. And if you’ve got teens in your home, here’s a summer bucket list just for them. Because they’re just too cool to be hanging out with you, right? The point of these bucket list items is that they are easy, spur of the moment ideas, that can take your family from ‘we’re borrrreeedd!’ to ‘yahoo!’ in no time! So keep it handy and when you need an idea, you know where to look. Lots of fun ideas here. Summer is our favorite time to be home in the Northwest, and picking berries is one of our favorite summer past times.